NYT crossword solution, 10 30 11 "Hollywood From Right to Left"
A delightful puzzle. Some folks grouse that letter-change (or drop-a-letter or add-a-letter) themes are intellectually arid but you know what? When done well, they can be amusing diversions. 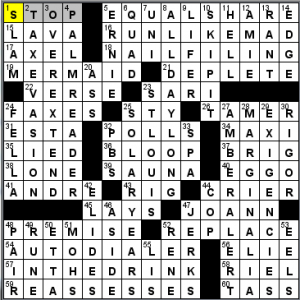 And isn’t that what the typical crossword solver is looking for? Andrea and Patrick’s theme takes movie titles with an R (or multiple Rs) and changes it (just one R) to an L. Jack Nicholson’s Anger Management becomes St. Peter’s ANGEL MANAGEMENT, and who among us can’t picture this after seeing It’s a Wonderful Life? The horror parody Scary Movie becomes a SCALY MOVIE like Snakes on a Plane. Did you know S.O.A.P.’s Samuel L. Jackson is the world’s top-grossing movie star? Astronaut flick The Right Stuff becomes THE LIGHT STUFF. Kinda boring. But the 21-letter grid spanner PILATES OF THE CARIBBEAN brought a smile to my face. Fantastic Four turns into FANTASTIC FOUL. I was also partial to TAXI DRIVEL (Taxi Driver). The comedy Wedding Crashers becomes WEDDING CLASHERS at the Hatfields’ and McCoys’ nuptials. Smooth fill throughout, and plenty of fun little clues. The constructors found space for such highlights as LENNOX LEWIS, a TV DINNER, a PUNCH LINE, IL TROVATORE, “SAME HERE,” and HYSTERIA—nice smattering of long fill. My favorite clue, humble though it may be, was 43d: [“You put the __ in the coconut…”] for LIME. Do you know the song? This clue/answer continue the light vibe of the puzzle’s theme. Two links for you. First, Ralph FIENNES (108a. [“Shakespeare in Love” star]) recently grumbled that Twitter is contributing to the downfall of the English language. Language Log linguist Mark Liberman eviscerated his argument quite nicely. 90d: FLETCHER is clued as an [Arrow maker]. Sporcle.com just published a quiz on English occupational surnames. It’s surprisingly tough! I gave you a freebie with Fletcher, though. Scouring the grid, I do find some blah bits like FISC and STYES. Rare is the 21×21 grid that doesn’t have a handful of lifeless short answers, though. I give this one a rousing 4.5 stars because it was a fun wordplay romp through pop culture. Jonathan L. O'Rourke's syndicated LA Times solution 10/30/11, "My Ex Was a Monster!" Greetings, crossword fans. There was a bit of confusion in the comments last weekend. 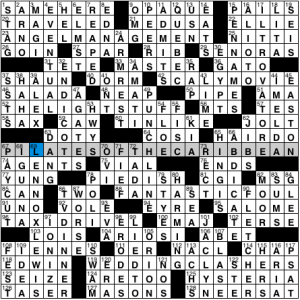 For those of you who don’t know, the Los Angeles Times Sunday Crossword does not appear in the L.A. Times newspaper. 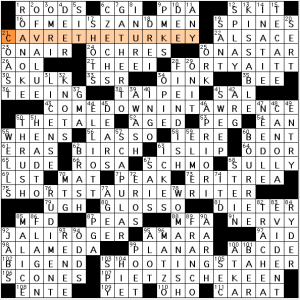 The L.A. Times carries Merl Reagle’s puzzle on Sundays. Confusing? A little. But remember that the Tampa Bay Rays don’t play in Tampa, the Pennsylvania Dutch were German, and Grape-Nuts contain neither grapes nor nuts. Today we have a spooky debut from Jonathan L. O’Rourke. Congratulations! It’s a fun theme featuring a quintet of boyfriends from hell. Well, maybe not hell, but at least three of them have spent time in coffins. 23a. [My first crush was on a mummy, but …] – HE’S WRAPPED UP IN HIMSELF. Most people have heard of Count Chocula and Franken Berry, but do you remember Yummy Mummy? He replaced Fruit Brute back in the ’80s. I know way too much about the monster cereals. 47a. [Everyone liked my ghost boyfriend, but …] – I SAW RIGHT THROUGH HIM. 67a. [I had a relationship with Frankenstein’s monster, but …] – IT CAME APART AT THE SEAMS. 89a. [When I moved to Sleepy Hollow, I started dating a soldier, but …] – HE KEPT LOSING HIS HEAD. 115a. [Now I’m dating Count Dracula. Things are going well, but …] – HE CAN BE REAL PAIN IN THE NECK. At least she’s not dating one of the sparkly vampires. What, no werewolf boyfriend? “He kept using all my Nair.” OK, never mind. Cute, creepy theme, and there were more Halloween treats sprinkled throughout the grid. 15a. [Hershey bar] – SKOR. I never scored any Skor bars back when I was trick or treating. I usually ended up with tons of SweeTarts and Pixy Stix. One year I saved all my Pixy Stix and used the powder to make Pixy Stix Kool-Aid. It tasted awful and was a colossal waste of Pixy Stix. 27a. [Chaney of film] – LON. Lon Chaney, Sr. or Lon Chaney, Jr. Take your pick. 62a. [“It’s __”: “Problem solved”] – OK NOW. Interesting entry, and one I don’t think I’ve seen before. It’d be more effective clued as a stand-alone phrase, something like [“Let’s get down to business …”]. 75a. [L.A. Angel, e.g.] – ALER. Remember what I was saying in the intro? Nope, the L.A. Angels don’t play in Los Angeles. Not even in Los Angeles county. 99a. [“Little Shop of __”] – HORRORS. Horrors! I almost forgot to include this picture of a real live witch. 3d. [Two-part David Bowie song from “Scary Monsters (and Super Creeps)”] – IT’S NO GAME. Never heard of it, but I like the “Monsters” tie-in. 13d. [Take up, as a homemade costume] – REHEM. Nice way to salvage a ho-hum entry. 14d. [Vampire-romance series] – TWILIGHT. After I finish the blog, I’ll be rehemming my Edward Cullen costume. 81d. [Munch museum masterpiece] – THE SCREAM. My favorite non-theme entry of the day. Other long entries I enjoyed: KLEPTOMANIA, CHESHIRE CAT, PIPING HOT, BONE CHINA, KOALA BEAR. Quite a fine debut for Mr. O’Rourke. Today’s puzzle rating: 4.25 blood-soaked stars. Starting in the northwest, there’s TAX EVASION, OVER-EXTEND, and PALM READER. All three are fine, but I especially liked the clue for PALM READER: [Person needing a hand]. The southeast stack has an AMBER ALERT, MARGINALIA, and EXIGENCIES. I tend to prefer 10-letter entries that contain two or more words, but both MARGINALIA and EXIGENCIES are cool words so I’m liking this set a lot. The southwest stack has both the liveliest long entry (IN THE DRINK) and the yuckiest one (REASSESSES). There’s a reason REASSESSES would never be used as the Bonus Round puzzle on Wheel of Fortune, and that same reason explains why it’s unattractive as crossword fill. There are two more 10-letter entries, SOLAR YEARS and the terrific ALL DAY LONG. So that’s 14 total 10-letter entries in a puzzle with only 70 total answers, or 20% of the total, a very high percentage. Often, a constructor needs lots of 3-letter entries to make that many long entries work. But this is Lynn Freakin’ Lempel, the Queen of Mondays and the Duchess of Smooth. There’s only eight three-letter words in the entire grid, and none triggers the Scowl-O-Meter. ST. LOUIS, home of the new World Series champs, is featured prominently down the middle of the grid, and other highlights include SKIP IT, MERMAID, and JO ANN Fabrics. I liked [Real tropper?] as a clue for a COP. But I keep coming back to one clue: [Lowdown coverup?] for MAXI. Does that really refer to what I think it does? If so, that’s just awesome. If not, well then forgive me. 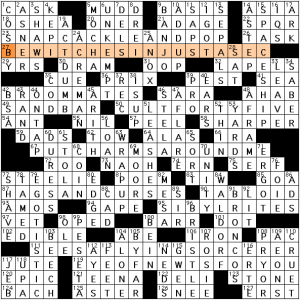 Merl Reagle crossword answers, 10 30 11 "Witch-ful Thinking"
23a. [Sounds at a witches’ breakfast party?] are Rice Krispies-related SNAP, CACKLE AND POP. 27a. [Claim on a box of Instant Magic Potion?] turns “be with you in just a sec” into BEWITCHES IN JUST A SEC. 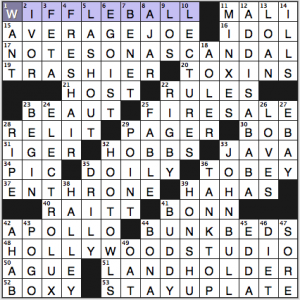 It’s unusual to see a 16-letter answer stacked atop an even longer one. 42a. [Witches who fly together?] are BROOM-MATES. 50a. [Name for a coven of middle-aged witches?] clues CULT FORTY-FIVE, playing on the Colt 45 revolver and brand of malt liquor. Can we please define “middle-aged” as starting after at least age 50? Some of us are in denial here, you know. 67a. [“___, Honey” (song sung by a witch’s hubby?)] clues PUT CHARMS AROUND ME. Can charms be “put around” a person the way arms can? 87a. [What X’s and O’s mean on a witch’s Valentine’s card?] is HAGS AND CURSES instead of hugs and kisses. I hate the word hag. It symbolizes men’s fear and loathing of old women. 95a. [What goes on at a witches’ sabbath?] clues SIBYL RITES (civil rights). Aren’t sibyls more like oracles than witches? 111a. SEES A FLYING SORCERER is clued [Spots a witch?]. The “SEES A” part is rather extraneous here, isn’t it? I think this one really wanted to be a 14 but it didn’t have a 14-letter partner in the grid. My favorite answers include ACT DUMB (19d. [Feign ignorance]), SPACESHIP (15d. [Vehicle to Venus]) UNKEMPT (6d. [Slovenly]). Pop-culture mystery item: 9d: BANJO is clued [George Segal plays one]. Really? Steve Martin is a lot more famously banjo-affiliated, isn’t he? Less welcome were 24d: Plow boss on an English manor], ACREMAN; 46d: [Carved pillar], STELA (also spelled STELE so you always need the crossing word to confirm the last letter); and 61d: [Roman robe], STOLA. All three of these answers intersect two or more theme answers, so Merl was constrained in what words could fit in those spots. 1a. [It’s white and has holes on one side] clues the WIFFLE BALL. 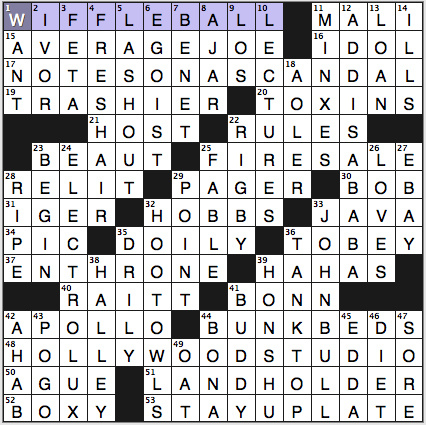 The clue confused me because I was picturing the ball with round holes all over instead of the official Wiffle with oblong holes on one half. 15a. AVERAGE JOE is the [Common man]. 17a. [2006 film with the tagline “One woman’s mistake is another’s opportunity”] is NOTES ON A SCANDAL. Don’t remember what this one is about or who’s in it. 48a. A HOLLYWOOD STUDIO clues [Many a set location]. 53a. [Choose not to retire, perhaps] clues STAY UP LATE, which is also the title of the best baby-related song for grown-ups ever, by Talking Heads. 4d. [Agoraphobic partygoer’s frequent need] is FRESH AIR, which is also the title of my favorite public radio program (and I’m still mad at WBEZ for moving its time slot). 12d. The crossword-friendly capital of Ethiopia, ADDIS ABABA, gets a pretty etymology clue: [Amharic for “new flower”]. I also like the geographic trivia of the two islands. 33a: JAVA (in Indonesia) is the [Most populous island in the world], while Japan’s 39d: HONSHU is the [Second-most populous island in the world]. 3d. [Tiropita filling] is FETA cheese. Never heard of tiropita, but spanakopita has feta. 9d. [Algeciras article] is LOS. The Spanish port city takes its name from the Arabic. 29a. [Handout at a busy restaurant] is a PAGER that buzzes and lights up when your table is ready. They’re annoying, but better than running the risk of not hearing your name called and having your table given away to the next party. 35a. [Inedible item on a plate] is a paper DOILY. You could probably eat it without suffering any harm. 22d. [Surname on the album “Revolver”] is found in the track listings, not the credits: Eleanor RIGBY. 42d. In the bible, AHAB was an [Ally of Jehoshaphat]. 44d. The Latin BONA, meaning “good,” is clued [It was good to Caesar]. 4.5 stars. Not super-exciting as themelesses go, but also free of clunky compromises. Fred takes a historical topic for his theme: Winston CHURCHILL is in the middle, and his famous “I have nothing to offer but blood, toil, tears and sweat” quote is evoked by the theme entries BLOOD DRIVE, TOIL IN THE FIELDS, TEARS ON MY PILLOW, and SWEAT PANTS. I kind of wish that the puzzle had been laid out such that CHURCHILL was at the end as a payoff, as the song title (I wanted TEARS OF A CLOWN, as I don’t know that many of the pre-1970 oldies) and SWEAT PANTS (or SHIRT or SUITS) felt anticlimactic to me. “TEARS something, SWEAT something, yeah, yeah.” It felt like a little more of a rote solve filling in what remained. I questioned why 42d: LEGIT was clued as the two-word LEG IT, [Walk in a hurry]. Then I hit 57d: [At least 21, to a bouncer] and wanted OF AGE, but found LEGAL and the explanation for why 42d wasn’t clued as short for “legitimate”—too close to LEGAL. If you enjoyed the history slant to Fred’s theme and you like acrostics, you should check out Cynthia Morris’s American Acrostics website. Currently the puzzles—which all pertain to American history—are available as printable PDFs, but in a few weeks there will be an online-solving option too. Henry Hook's Sunday crossword, "Claim to Faim"
As the title hints, the theme has to do with famous people and misspelling a word (that rhymes with a name) to match a different spelling. Brett Favre will CAVRE THE TURKEY. Bonnie Raitt yields FORTY-AITT stars on a pre-Alaska/Hawaii flag. Gertrude Lawrence (who??) has an ordinary spelling for her last name, but “torrents” change into COME DOWN IN TAWRENCE. I would have gone with Vicki L. Author D.H. would look too much like a courier service with his last initial. Hugh Laurie: SHORT STAURIE WRITER. Friedrich Nietzsche: PIETZSCHE KEEN. Henry saved the best for last. Just enough mind-bending in this theme to keep the solver on edge. I always appreciate anything that rewards me for being attuned to spelling, but I could see the reluctant speller struggling to put things together through the crossings here. Now, there are a lot of oddball answers that I may never have seen before: ENTE, BIG END, AMARA, PMKS (postmarks?? oof), and BOURREE. I was okay with INGO (Jax! ), ICKES, SERT, ATKA, which are likely on the less familiar end of the spectrum for a lot of solvers. This entry was posted in Daily Puzzles and tagged Andrea Carla Michaels, Fred Piscop, Henry Hook, Jonathan L. O'Rourke, Lynn Lempel, Merl Reagle, Patrick Berry, Patrick Blindauer. Bookmark the permalink. Very nice puzzle if for no other reason than fresh, long clues such as LENNOX LEWIS and IL TROVATORE….but the theme was fun too. IL TROVATORE is surely the longest answer to appear in the NYT fill on consecutive days, right? Ralph FIENNES wasn’t in “Shakespeare in Love” — that was his brother, Joseph — but he soon will be in Shakespeare’s “Coriolanus.” (Not sure I buy the LL analysis of tweets; aren’t many of the short words skipped to make the 140-char. limit?) The new Shakespeare film, “Anonymous,” I found much more worthy than what the critics are saying. It’s over the top, and hardly the most credible presentation of the Oxfordian theory, whatever its merits, but the performances are fun to watch and no matter what you think about the authorship intrigue, the movie’s ultimately a celebration of the greatest writer in the English language. The critics seem upset because the story seems unbelievable. 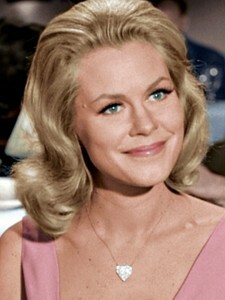 But Gwyneth Paltrow passing as a man…oh, that’s a good one. And the LAT was really clever too! The extra tie-ins and plethora of great long-entries were indeed very nice! @joon: maybe it’s a tie-in with that new Crosswords for Opera Lovers book. 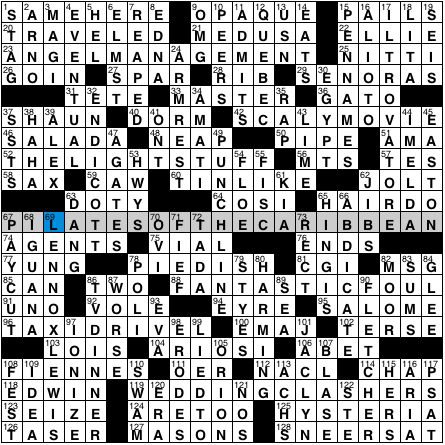 Congrats to Acme and partner Patrick–the NYT puzzle was lots of fun. Though I’m not much of a movie-goer, the clues were good enough to figure out what was wanted once I had most of the theme answers! For a straightforward letter switch, I loved today’s NYT. Especially liked ‘taxi drivel’. Trovatore two days in a row!! Is ‘lime in the coconut’ a quotation or expression of some sort? Ok, I admit I didn’t do yesterday’s puzzle, so maybe IL TROVATORE wasn’t so fresh, but it was fresh to me. Gareth, the enlarge grid function is working ok for me. And it’s been used in a movie or commercial or two since then. Still no sign of the BG/Hex/Hook at puzzle pointers. You have to post your movie reviews more often, maybe on the Cru Crossword Forum. Please. If you’re referring to the recent discussion on C-L about letter-change puzzles, I think it was pointed out that the main gripe was more about the frequency of such puzzles. My own complaint was with those in which the fill becomes a nonsense phrase, which today’s puzzle comes close to. By some stretch, one can imagine an ANGEL MANAGEMENT or LIGHT STUFF, even a FANTASTIC FOUL, but it’s more difficult to make meaning of SCALPY MOVIE or TAXI DRIVEL– or am I missing some nuance of the theme? 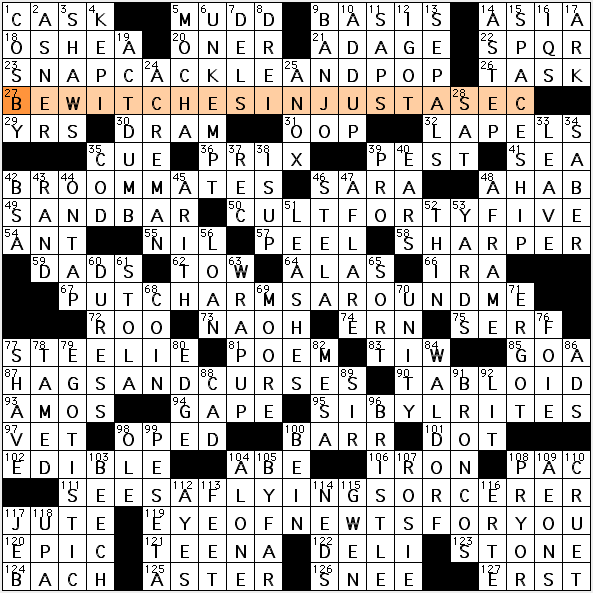 Special shout-out for Patrick Berry’s Post Puzzler today — tough but fair! Having BU__ for the Space-savers I wanted “Built-ins”, but no — that was BUNK BEDS! Likewise with FA___ as Work with animals I thought of first of “Farms”, but again no — that was FABLE., which we’d seen not so long ago. Loved the PAGER one is given when waiting at a busy restaurant… might have been “Paper” if eating breakfast out. His cluing is as fabulous as the actual solutions. I liked the theme enough to like the puzzle, but there were lots of little things I didn’t know. The coconut song kept me from touching that little block to the very end. I also looked a few times at LENNOX LEWIS, not knowing it, since it then looked like an implausible name. Also, I’d have said that SAME HERE is agreement, often muted, whereas the clue is something else again. But my one real problem was not being able to fill the cross of LITA and NETTI. Not knowing which was more implausible, I decided to go with LISA, which was wrong. I’m not convinced I should have known better. Yes, Samuel Jackson takes it, for most people’s definition of “movie star,” though he’s beaten out on this list by voice actor Frank Welker, who’s pretty impressive in his own right. Of course, nobody heads out to the cinema to catch the latest Frank Welker picture. His individual contribution to the grosses is surely less substantial than a before-the-camera performer, no?